Apple announced a October 26 release date for Mac OS X Leopard (10.5) today, along with more detailed information on the new system, including over “300 New Features”. Let’s look a little closer at the features in the Fonts category and give them snarky grades based on their potential value. Print out comprehensive previews of your fonts, including sample text in varying sizes or all available glyphs. Just select fonts in Font Book, choose Print from the File menu, and select any of the three built-in report types. Grade: B This is one of the more common requests generated by our young, font hoarding culture. It’s kind of something that should have been in Font Book 1.0, and any other font manager can print catalogs, but it will be interesting to see if the new Font Book can do it better. 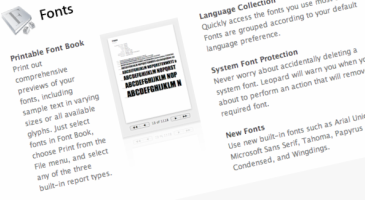 For a quality type reference there’s always this FontBook. I whole-heartedly recommend it without bias. Quickly access the fonts you use most often. Fonts are grouped according to your default language preference. Grade: B- it’s unclear how this will look, but it sounds like it might be handy for those who do multilingual or non-Western language work. Never worry about accidentally deleting a system font. Leopard will warn you when you’re about to perform an action that will remove a required font. Grade: C Another request I often hear from OS X users. There are so many fonts installed by the system and other software that most folks are bound to want to weed some of it out. The problem is that dumping a required system font can lead to headaches down the line. Apple has provided OS X font lists that note which fonts should not be disabled, but it will be nice to finally have this safeguard built into the system. Use new built-in fonts such as Arial Unicode, Microsoft Sans Serif, Tahoma, Papyrus Condensed, and Wingdings. Grade: F Sorry, Apple. Papyrus Condensed does not qualify as a “feature”. And it’s easy to poke fun at Arial Unicode, Wingdings, and Microsoft Sans Serif, but they might be of use, if only for compatibility with websites developed for Windows. The more serious issue is what’s missing in this list. Beyond basic OpenType support in Cocoa apps, Apple has all but ignored typography since OS X was born, seven years ago. What was going on in Cupertino while Microsoft was developing ClearType and commissioning premier type designers to create universally acclaimed fonts for Windows Vista? Steve Jobs, the guy who gave a graduation speech lauding his own pioneering efforts in typography, should be embarrassed to watch Microsoft showing Apple how to do it right. Automatically activate fonts as you need them. When an application requests an installed font that’s currently disabled, Leopard activates that font and keeps it active until the requesting application quits. Grade: A The third-party font managers (Suitcase, FontAgent Pro, Linotype Font Explorer) have given it a valiant try, but automatic font activation should really be a system-level operation. If Leopard’s auto-activation is fast and accurate it is easily the system’s best new font feature. Take advantage of new Braille support for VoiceOver with Apple Braille Regular, Apple Braille Outline, and Apple Braille Pinpoint fonts. Grade: B I am blessed to have my sight so I don’t know the value of this feature, but I applaud any advances in accessibility. Well said. I first thought that the new fonts were a joke. I don’t even know how Papyrus Condensed look like, and I’m not sure I want to know. Even TextEdit doing smart quotes is better news! Let’s give grouping by language (for fonts this applies to) at least a B+. Try moving around between the Roman alphabet, simplified Chinese, traditional Chinese, and Japanese (which shares characters with both traditional and simplified Chinese in varying quantities). Microsoft Word has been doing this grouping for ages, but it still often glitches on the switch. Excuse me for this possibly being a dumb question: can we print previews in other font utility software? I’ve made my own in InDesign, but I’m always up for something that takes less time. Sounds great and like real improvements! This is not a fair analysis at all. The new fonts may get an ‘F’ grade in your view, but the real reason they’re included is not for website compatibility, it’s for compatibility with MS Office documents. The lack of Wingdings in particular has been a perennial thorn in the sides of people who use Keynote but who get sent PowerPoint documents… the bullets end up looking different, and you think it’s an import bug, but it’s actually because of font substitution. Keynote ’08 has made this more clear, but a little change like this — including common Office template fonts — will do a lot to reduce people’s frustrations with shared documents. It’s one of those little features you don’t appreciate but it really does make a difference. It’s also not true that those are the only typographical changes in Leopard. When Tiger was released, support for OpenType advanced features in all Cocoa apps wasn’t even listed on the Tiger features list, but it was included. The type group at Apple is hard at work, even if a lot of their work goes into the mechanics of the underlying type system. The XeTeX group in particular will benefit from a lot of the changes. Microsoft’s choice to commission new fonts for Vista is also a cheap shot. Microsoft commissioned those fonts, especially the Lucida Grande lookalike, as a direct attempt to follow Apple’s lead. MS was chasing Apple’s tail lights, not the other way around. It is true that Microsoft deployed an advanced font for Arabic typography earlier than Leopard, but that’s only by virtue of them wanting to bundle their version with Leopard. Vista is still a mish-mash of font rendering, with only a handful of apps using the more recent versions of the .Net framework even supporting ligatures across all user interface elements. OS X has been doing this since the beginning. Good work is being done at MS with respect to typography, don’t get me wrong, but Apple is still in the stronger position. Ahh, Font Auto-Activation. Excellent, I never really trusted all these plugins that were supposed to do the trick. Alan: some good points that I overlooked. Thank you. The other two links he gives are old news and, think what you will about them, are not really relevant to this. Just thought I should give my view on that, as long as I’m posting anyhow. Remove the “Microsoft” from the end to get this page. It’s one of the articles about Segoe’s similarities to Frutiger Next. Whether it is or isn’t a Frutiger rip-off, we don’t have a Frutiger look-alike included with Mac OS X, despite Apple’s use of a modified Myriad Pro in their marketing! I don’t think Apple can be criticized for this. I think the right Apple approach is to first provide fonts that are in common use, and not help build the popularity of new document fonts commissioned by Microsoft. Anyway they have my phone number so when the time is right they know who to call. That is the other aspect of Microsoft’s strategy that’s important to mention. The primary reason MS commissioned the new fonts is because they’d rather not pay royalties, not because they’d like to improve the variety of fonts floating around out there. They wanted Lucida Grande, but it’s more cost-effective for them to commission a version of it that they own royalty-free. Same with Frutiger Next (Segoe), same with Helvetica (Arial), etc. There’s nothing wrong with this, of course — the history of typography is in large part the history of foundries copying one another with small variations — but it’s also not fair to fault Apple for going for the genuine articles rather than commissioning their own versions. Which would you rather have, genuine Helvetica or Arial? Similarly, Apple could have commissioned a new version of Wingdings, for instance, but they took the high road and licensed the genuine font from MS. This is not to say that there is not innovation in some of the new MS fonts, but that it’s wrong to paint their development as a purely benevolent, whimsical exercise in novelty that Apple should darn well have copied. That’s missing the bigger context. Thorsten : I suspect the system auto-activation will only work for cocoa apps. But who knows. Arial is a joke, no matter how you twist or turn it. Having something better than Arial, but a huge Unicode set, now that would have been cool. But Arial? Thank goodness for Arial Unicode. I have clients typing on PCs and my Mac cannot display the non-english text. Wahoo. I’d say you missed the majority of the real new font features in this review, which come as part of a massive overhaul of the underlying text layout and typography system (making it really easy for developers to control every part of the process without writing too much code), which should hopefully lead to more and better end-user programs taking advantage of advanced typographical features. Because most applications on the Mac use standard components, typography on the Mac (text layout, glyph rendering, support for OpenType features, etc.) is consistently high-quality. On every other platform *COUGHwindowsandlinuxCOUGH*, most applications look like garbage, in part because of their abysmal typography. Personally, I think OS X ships with a pretty nice collection of fonts (certainly compared to Windows XP, which is the last version I have to compare with), which allow its users a decent range for expressing themselves. Font Book is a decent program for 95% of computer users (read: regular users), though it would be nice to have a tool with a slightly higher ceiling for “power users”, Font Book in Tiger becomes pretty useless. Fortunately, Linotype’s free FontExplorer X is pretty great. And other tools exist for those who need still more control. It’s nice that it will now allow printing fonts, but I don’t expect that will really satisfy the needs of users who can’t stand Tiger’s Font Book. I’ve been trying to to build a collection of fonts that covers the entire Unicode range of glyphs. There have been two fonts that have stood in the way of doing this, the first one being Tagbanwa which, although one can get it now, has been unavailable for a while, and MS Arial Unicode, which Mac users could only obtain legally if they bought Office. It’s good that Apple have decided to include Arial Unicode just for this reason. When I look at the Character Palette, I do not want to see any unfillable gaps. The best feature in regard to typography is easily Quick Look. You can finally, easily, preview fonts from the Finder — without a helper application. Fantastical. Didn’t know Quick Look could view fonts, Rob. Great news. Will this finally give us a big Unicode font which supports italics and boldface? Multilingual rendering of web pages is still better on a Mac than in Explorer, but the lack of such a font is still an impediment to good online typography. The real thing Apple should have done was fix their OpenType support so that glyphs can be selected by unicode value and end the need for work-arounds for Greek/math glyphs and some CE glyphs as well. The other stuff Apple did for printing specimens and activating fonts on the fly was well needed for years. If ClearType (aka Rainbow Bride) were only a quarter as good as ATSUI CRT we had something there. It’s one of the top 10 reasons making Windows physical pain to use. Don’t get me started on Adobe’s heckler type (CoolType). That’s just abysmal. No words. I’ll stick with FontB ook as 80% of my apps run on the BSD foundation and the other tools failed to show me the fonts there so far. The only statement on this page remotely interesting (that we don’t already know from looking on Apple’s own feature page) is Rob H’s comments about fonts being viewable from the Finder with Quick Look. So I’m installing Suitcase Fusion right now, and thinking maybe I shouldn’t bother complicating things with a font manager if Leopard is going to take care of all that font stuff. Am I right? It depends on what you need, Mike. If auto-activation is the only reason you installed Suitcase than you may want to hold on for Leopard. But pro font managers like Suitcase can offer a lot more, like advanced previewing and organization. Font Book has been pretty limited in the past and we don’t know if there will be limits to its usefulness in Leopard. What if you can only have a certain number of fonts open? Or there could be a limit to the number of fonts that can be activated. Can it resolve font conflicts? Can it handle a suitcase that contains TrueType and PostScript parts? Only time will tell if we can trash the font management programs that we regrettably depend upon daily. The value of these “grades” is far from apparent. It isn’t even clear what the basis is for the grades. For instance, the grade for System Front Protection is “C,” but that doesn’t seem to be based on the implementation of the feature, but the fact that it wasn’t previously included. These seem to be reviews of features which have never been seen by the reviewer, which makes them exercises in psychic prognostication. In this charade, the most ridiculous part must be the grade for Braille Support, which says, “Grade: B I am blessed to have my sight so I don’t know the value of this feature, but I applaud any advances in accessibility.” Why not a grade of “F,” then, for the sighted reviewer for whom the feature was not intended? If it works well for someone who is blind, does any rating below “A” have any meaning at all? Consumer Reports could save a lot of trouble by adopting this approach to ratings. They could rate the 2008 Honda Accord simply by looking at the manufacturer’s press release. With those words, my hope is that everyone senses my tongue is in my cheek. Sure, my grades are based on my perceived significance of each feature, but this is not a “review” — it’s a gut reaction. At first glance I hadn’t recognized you as the reincarnation of Voltaire, but now it is clear. Are there design professionals out there not using another 3rd party for their management and actually relying on Apple’s internal management? If so I’d love to hear ‘why’ you’d prefer to use Font Book vs Suitcase, Font Explorer, aside from being “free”. In Mac OS X 10.5, Apple added support for all OpenType GSUB and GPOS lookup types, so that advanced OpenType Layout features such as contextual alternates or mark attachment works in all Cocoa applications (e.g. TextEdit, Keynote, Pages etc.). I just tried Zapfino Extra LT Pro, and the contextual features work like a dream. Also, they added OpenType linguistic engines for some complex scripts so that e.g. Arabic can be displayed using any OpenType font (while previously it required AAT fonts). The Typography palette has undergone some minor changes, e.g. it now allows activation of “smcp” and “c2sc” at the same time (though stylistic sets are still accessed on an alternative and not additive basis). I must say this is great news. Chris L., I’m not sure what you mean about selecting glyphs by Unicode value. (And, BTW, Unicoders would cringe at the idea of selecting “glyphs” by “Unicode value.”) The Character Palette and Unicode Hex Keyboard let you do exactly that and have been present in Mac OS for a long, long time. It’s only applications that draw text via QuickDraw that still need hacked fonts, and Apple strongly encourages people to migrate from QuickDraw text drawing ASAP. I don’t think so, but there are professionals that bypass 3d party and FontBook and put (aliases of) fontfiles directly in the Font folders in the User library. Providing you are an organized person, that’s a good and working solution. Wow, auto font activation. That might be a good enough reason for me to upgrade. Extensis Suitcase is failing me and I’m having all kinds of font issues. Well, they got one thing fixed that was broken with 10.4, and stayed that way. With 10.4, alternate glyphs did not work. Finally, Apple has fixed this with Leopard. Seems a shame to buy Leopard for the fix to something that Apple broke. The problem occurred with 10.4, not 10.3. What is the best font management program for OS X? Particularly for Creative Suite 3? Cathi – I used to be a FontAgent Pro user, and it served me well for many years. But the free Linotype FontExplorer X does all that FAP does, and more, in an elegant iTunes-like interface. I highly recommend it for casual users and pros alike. i just migrated from tiger to leopard, and did it in a vey “clean” way… i was wondering what’s the deal when migrating fonts… do you have any tipp?